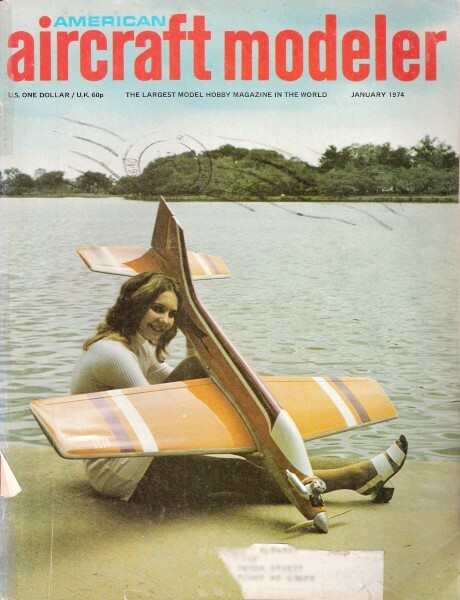 Since there is a lot of wisdom conferred each month upon the model aircraft magazine reading public, I thought it would be of service to scan, OCR (so you can search the text), and post some of the articles from vintage American Aircraft Modeler magazines. This first is the "Walt Mooney on FF," from the January 1974 edition. There will be more to come. A Little Bad News With A Moral: For many years the San Diego Orbiteers have enjoyed the hospitality of the City of San Diego and the U.S. Navy and have been allowed to fly on the city sanitary fill which was in, but below, the traffic pattern for Miramar Naval Air Station. This great arrangement is no more. Someone (a non-member), known but unnamed here, put up a 12-ft. span RC glider to an altitude of more than 1200 ft. for a period of hour or more at the flying site while the Week End Warriors were practicing landings. As might be expected, four of the Crusader Pilots complained of having something that big pass over their heads while they were trying to keep ahead of their own birds flying the pattern. Rubber-powered, 18-in. Fairchild 24 is an Earl Stahl design and a Paul McIlrath construction. Plans available from John Pond. Grand Junction modeler "Kirk" Kirkam watches his Stinson 0-49 lift off for a winning flight in Gas Scale. 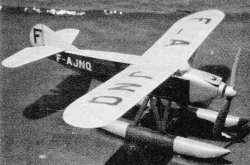 Curious Spratt Flying Boat constructed and flown by Jim Adams. 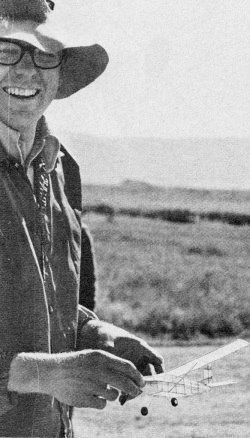 George Swanson, Salt Lake City, Utah, placed third in Rubber with his Peanut Pilatus. Focke-Wulf "Stosser" rubber-powered model by Jim Wright of the San Diego Orbiteers. Aeronca LW electric-powered model, by Lloyd Brickner. 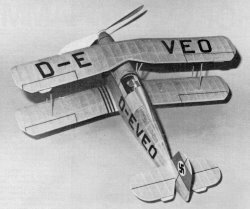 Douglas Mooney's uncovered, Peanut Scale DH 6. Bucker Junqmeister by Ed Coleman of Canada, 2nd place Biplane Class. Soon a detachment of Marines was sent out and all model builders were instantly and permanently evicted. Now, all the RC pilots out there know this is a no-go. Further, the guy flying the model was a Navy man so he knew better. In addition, the non-RC flying members of the Orbiteers are not completely guiltless either. Some of them witnessed the flight, but did not force the culprit to bring the model down to a reasonable altitude. Perhaps someone can learn from this collection of errors. I f you see someone doing something dangerous, tell him about it for his own sake. If you are going to pay the price for his folly, make him stop. Needless to say, the Orbiteers are making a large effort to find another suitable flying site which is not easy in Southern California. Contest Results: Editor Warren C. Hoaglund mailed me a copy of Balsa Chips the newsletter of the Grand Junction (Colorado) Model Club. Issue No. 12 gave the results of their annual contest. They ran 17 events and had 122 entries total for all events. G.R. Kirkham of Grand Junction, flying a Stinson 0-49, won Gas FF Scale. 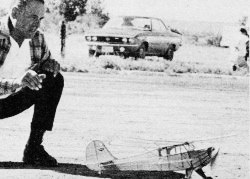 Noal Hess of Salt Lake City took first in Rubber Scale flying a Taylorcraft . 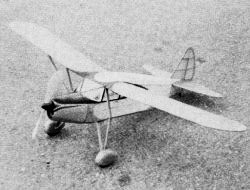 George Swanson, also of Salt Lake City, flew a Peanut Scale Pilatus Porter to third in Rubber Scale. It's impossible to list all the winners in all the events. After the flying on Saturday, however, the members wives provided a real feast, so surely all the contestants were winners Saturday night. The Flightmasters' Seaplane contests have been given coverage from time to time. FF Scale seaplanes turn out to be quite a challenge, especially if scale floats are used. The picture of my 28-ft. Latecoeuer 283 shows one that will successfully take off using scale floats. Its batting average is about 250. 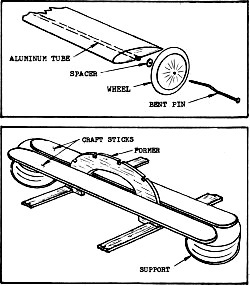 Since its sidewheel steamer antics caused it to capsize during three out of four takeoff attempts, the floats were modified by adding a 3/32 x 3/16" wedge step halfway from the float nose to the scale step. This is almost unnoticeable, but what an improvement! Instead of taking a 25 or 30 ft. run to get off, the model now jumps off the water in two or three ft. The batting average has gone up to about 800. The model requires 12 strands of 1/8 flat rubber for power. Best time so far is about 30 sec. ROW. The Northrop Flying Wing Contest: Scheduled for November 25, this annual contest is a real challenge and has been drawing more entries each year. More Contests: December 9 is set for a large and small of it All-Balsa Contest at Lake Elsinore. The Rockwell International Flightmasters are sponsoring a Jumbo and Peanut Scale Contest on the dry part of the lake. Peanut Scale News: There is a new high time record for Peanut Scale, at least as far as the San Diego Orbiteers are concerned. 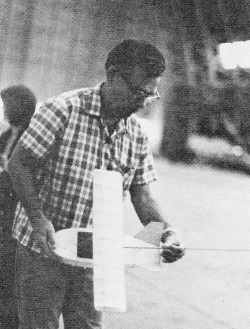 At their last monthly Scale contest, several of the Peanut entries made flights of over two min. and it looked like the competition was going to be a hard fought one. Then Clarence Mather put up his Peanut Cougar and it proceeded to thermal up for nine and a half min. before it finally went out of sight overhead. Probably a loss like this (or was it a win like this?) doesn't please Clarence very much. The rest of the competitors, however, were kind of glad to see it go. It always did too doggone well. Fortunately their respite will not be of long duration. Clarence is sure to come up with another good one in a fairly short while. Paul McIlrath of Cedar Rapids, Iowa, has built a really neat 28-in. span Fairchild 24 from Earl Stahl's plans. As Paul put it, "It is hard to beat the fine designs of Earl Stahl." They still provide a standard of excellence in rubber-powered scale. The Rockwell International Flightmasters: Their annual Scale Seaplane contest and Picnic was a great success. Once again the weather was perfect for Free Flight Scale at the lake. Flying seaplanes is always challenging, but it gets better every year. Hal Cover showed us all how once again in Rubber. In CO-2, Walt Mooney's Dornier won again. It was the only CO-2 to qualify and it just kept making flight after flight like there was nothing to it. After a smooth takeoff and a circling climb, it gradually straightens out and cruises down to a landing which is followed by about five yards of taxiing on the step. CO-2 motor characteristic of gradually slowing down, rather than the abrupt stop of a gas engine, makes for realistic and pleasing flights and landings. Unfortunately, the lake has dried up somewhat and the telephone poles and lines that used to be out in the middle of the lake and completely out of reach were very near to the takeoff sight. This situation evoked a few sighs at some near misses, and some groans when a RC Spectra hit the wires. This little CO-2 Dornier has won the CO-2 event at the last two Flightmasters' Annual events. Your correspondent's rubber-powered Latecoeur seaplane. Salt Lake City's veteran scaler Noal Hess watches his Taylorcraft lift off for a winning flight. The picnic held at Fernando Ramo's place was superb as usual. Fernando has a two-level model building shop filled with interesting projects. l n addition to scale of all kinds, he also has a' full-scale biplane under construction and upstairs there is also a great HO gauge railroad. Press a button and you can hear the whistle blowing. Too bad the ecologists are all striving for less noise or he could set up the roar of an aircraft engine button operated on the lower level. A couple of weeks later the Flightmasters held their Rubber Speed Contest in San Marcos. Flying was scheduled at the high school field, but was rescheduled at the last moment for the Palamar College field. Nevertheless, no one got lost - everyone gathered at Russ Barrera's model museum before the contest. This is a great gathering place arid was the site of a get-together after the contest when Bill Warner showed slides taken at the Oshkosh NATS. A small percentage of the audience ignored the slides, however, in favor of Russ's large collection of aircraft, modeling books and magazines from all over the world. If Russ doesn't have a three-view of it, it probably doesn't exist. Rubber Speed has reached the place where they seem very fast. 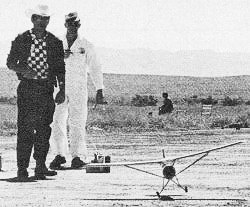 Unlimited was a hard fought contest between Bill Warner and Bill Hannan with Warner eventually winning with a speed of 67.5 mph , His all-sheet model called the "Hot Gnat" spanned about eight in. and had a plastic propeller no more than four in. in dia. Several of the models were in the region of 60 mph , Bill Hannan's was timed at 61.8 mph. Scale entries were limited to models of closed course racers. These were notable for much lower speeds and longer flights. Bill Pardue's Monocoupe practically flew out of sight and several others flew into adjacent tennis courts where they attempted to strain themselves through the wires. Jack Elam was awarded the prize for the slowest qualifying flight - a bottle of castor oil, to GET HIM GOING, presumably by lubricating his rubber motors more efficiently. The only other event was Schneider Cup Scale. These seaplanes were supposed to ROG (Rise Off Grass) but none qualified. Bill Strohman made the best and the most attempts with his Italian hydrofoil racer. The model was nothing if not the strongest ever made (it was terribly tail-heavy to begin with). and Strohman's antics on the field had everyone in stitches, so he was awarded a prize for his efforts. Construction Ideas: Steve Manion of Pocomoke City, Maryland, sent two ideas which can be used in building. For WWI or similar models, with cross axles that the axle include a length of aluminum tube in the cross member. Then to attach the wheels, simply use a bent pin through the wheel and inserted into the tube. The bend imparts enough friction to retain the wheel which is still easily removable, and the head of the pin looks better than a blob of cement or a bent wire end. The second idea is one to help hold ribs or formers vertical while building over a plan. He uses a couple of craft sticks (old popsicle sticks would do), cemented to supports. He used paint jar lids with a gap between the sticks about the thickness of the rib or former. These are simply set over the rib to hold It vertically while the cement is drying.